Everyone working at Aviva in the UK, whether they are a permanent employee or an on-site contractor receive at least the real Living Wage. We made this commitment because it is the right thing to do. And because it also makes good business sense. We want to be an employer of choice, which helps us to protect the long-term success of our business. But we also know that paying the Living Wage is good for our industry and business at large. Employers who pay a fair wage have a multiplier effect, because as ambassadors they help encourage other businesses to do the same. Paying the real Living Wage will create a better, stronger and ultimately a more successful company for our customers, our people and the communities we are a part of. We were delighted to be the first luxury retailer and manufacturer to gain full UK Living Wage accreditation not just for directly employed staff but for all third party employees in the UK as well. We are very proud of this achievement as we believe that all our employees should be treated fairly and in accordance with our ethical trading guidelines and pay is a significant part of that. As a values-driven business, IKEA’s vision is to ‘create a better everyday life for the many people’. This includes our co-workers as much as our customers. We believe in paying a meaningful wage for all of our co-workers and making a positive impact on their lives, irrelevant of their position, age or location. At IKEA, we are proud to pay the real Living Wage and view it as a worthwhile investment in our people. They are our most valuable asset, and we believe that having happy co-workers will ultimately lead to our customers receiving a great experience when they shop with us. As a large company, we also want to share our positive experiences and encourage other businesses and organisations in the UK to become real Living Wage employers. At the Joseph Rowntree Foundation and Joseph Rowntree Housing Trust we want lasting change for people and places in poverty, communities where everyone can thrive and a more equal society. We think it’s vital that we practice what we preach as an employer. Our commitment to paying the Living Wage makes complete sense to us, not just because it’s the right thing to do but because we also believe that staff who are valued through receiving the Living Wage are more engaged and productive. At KPMG, we believe that businesses that can afford to pay the real Living Wage should look to do so. It is critical that we reward and value those making a contribution to our society and economy, and for businesses to see beyond the bottom line, focussing instead on the positive non-monetary aspects that the real Living Wage can bring, like improved staff morale, rising service standards and increased productivity. It is not just the right thing to do, it makes absolute business sense. It ensures that we attract and retain the best and most motivated people, whether directly employed by us or by others. We want good people and the Living Wage is an excellent way of getting and keeping them. As one of the UK’s largest high street financial services providers, we understand the money issues faced by those on lower incomes. Paying a fairer wage helps people by contributing to the cost of living and enabling people to start saving. This is why Nationwide not only believes in paying its people the Living Wage but has committed to supporting the Foundation and help spur other companies across the UK to join. As a major UK employer, we know that acting responsibly and making a positive socio-economic impact is not only good for the communities we operate in, but also makes good business sense. Supporting the Foundation as a Principal Partner underlines our belief that people are at the heart of our business. 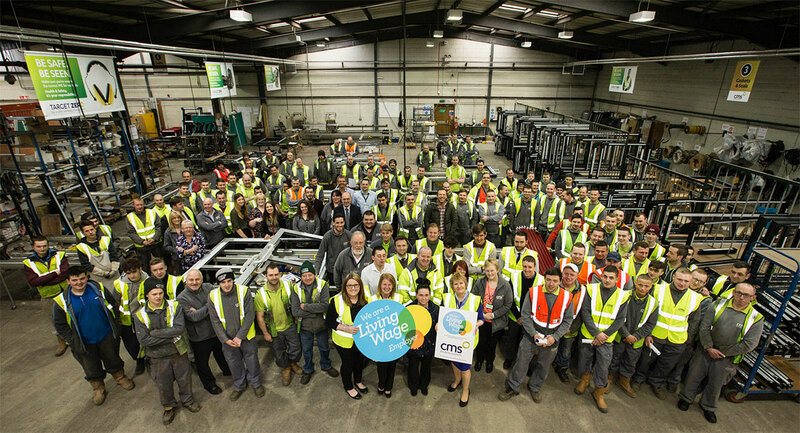 We are proud to be the first mainstream manufacturer in the UK to become a Living Wage employer and see this as an opportunity to be a positive influence in our sector. For Oxfam, there is nothing more material to our mission to overcome poverty than people being able to earn a decent income from work. Sadly this basic right is currently out of reach for millions of people here in the prosperous UK and across the world. We support the Living wage Foundation because we believe that fair wages, along with more secure, predictable and progressive work can be instrumental in addressing the high levels of poverty we are now seeing in working households in the UK. Paying the living wage and bringing the cleaning service in-house has brought dividends to Queen Mary. The college is cleaner, staff feel rewarded and the wider community – both on and off campus – have fully backed the idea. We are proud supporters of the Living Wage Foundation. As experts on the challenges faced by those in work and on low to middle incomes, we’re well aware of the difference the living wage can make to people’s lives. We’re delighted that the Foundation will spread best practice and provide advice and support to those employers who do choose to implement a living wage, and we hope its take up spreads as a result. Paid work is the most important route out of poverty, but a substantial number of workers in the capital are still paid wages that are simply not enough to support them and their dependents. As a charitable trust that exists to tackle poverty and inequality in London, we helped establish the Living Wage Foundation in order to persuade other employers that paying a living wage is the right thing to do in order to help lift the working poor of London out of poverty; as a living wage employer ourselves, we would strongly urge other employers to do the same.